On December 6, from 1–4 PM at the Graffiti House, the Foundation will hold its Old Time Christmas Party featuring the dulcimer music of the Wilderness Run Players, Santa Claus, “Robert E. Lee” and a book signing by Carolyn Reeder. Be sure to get to the Graffiti House early on December 6th. There will be lots of delicious food & drink. There will be great opportunities for filling your gift list: KARLA'S GOODIES will be for sale again, Carolyn Reeder’s book (see below) will be for sale; and Journey Through Hallowed Ground: Birthplace of the American Ideal and other books will be available in the gift shop! Also T-shirts, ornaments, and more! Door Prizes and Poinsettias will be given away. Come enjoy ! All are so very welcome and no RSVP is necessary. 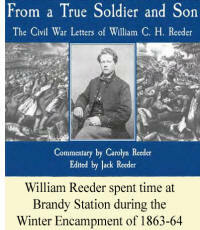 One special feature of the party is a book signing by Carolyn Reeder of the new publication of From a true solder and son: The Civil War letters of William C. H. Reeder. Thirteen of young William's letters to his parents were datelined either Encamped near Culpeper or Brandy Station. He wrote that he was close to the railroad 'where we can see the iron horse as he goes snorting by.' Besides describing daily life in winter camp, William's letters give a first-hand account of the Mine Run Campaign, fought near here. Three years of young William's letters to his parents in Indiana—plus commentary, maps, and illustrations—have been compiled by Carolyn and Jack Reeder. (Many Virginia readers are familiar with their books about the people who lived in the area that is now Shenandoah National Park.) Proceeds from the sale of this book are dedicated to the Graffiti House Restoration Project; the book is available in the gift shop. Join us at the Graffiti House for this annual Christmas celebration on December 6! March 20, 2009 – Brandy Station Foundation Annual Dinner. 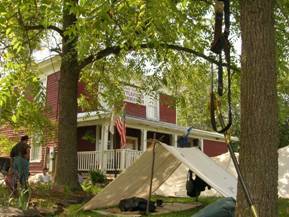 Join us as we celebrate 20 years (1989-2009) of effort by dedicated volunteers to conserve and protect the historic rural character and the Civil War battlefields of the Brandy Station area within Culpeper County, Virginia. The dinner will begin at 6:30 PM in the Brandy Station Fire Hall, 19601 Church Road, Brandy Station, Virginia. The special guest speaker will be Dr. Daniel Beattie who recently published a book: Brandy Station 1863: First step towards Gettysburg (Campaign) It is published by Osprey and is volume #201 of the Campaign Series. The author, a generous supporter of the BSF, will be signing copies of his new book. With members of the BSF, the Orange Blossoms walked the hallowed fields where the soldiers whom they recreate fought and died. What made the experience more enlightening was the unit brought pertinent letters, diaries and reports from the engagement. With these in hand, they were able to accurately mimic the movements on that fateful day. After leaving the battlefield, they journeyed to Culpeper National Cemetery to view the grave of Private Henry Appleman. Appleman died on February 26, 1864, during the Winter Encampment. They also saw where the 124th New York Infantry wintered on what was formally the Dr. Samuel Rixey farm. The day ended at the gates of Auburn, where they were fortunate enough to meet Bill Barron, owner of the historic farm, who invited them onto the grounds for a closer view. On October 11th, three generations of David Guinns gathered for the first time in many years in the historic house that had once belonged to their family. The eldest Guinn, the previous homeowner, came from Fairfax to celebrate the marriage of his son, David, the boy who discovered the graffiti on the house's walls hidden behind years of plaster and paint. As period music was heard through the 150–year-old building, a young ring bearer dressed as a Confederate soldier led the wedding procession. He was followed by the Matron of Honor, and the Bride, Barbara Shellito, both adorned in beautiful lace dresses with billowing hoop skirts, one in ivory and the other in pale blue. Barbara was presented to her future husband, David, by her brother. The elder David Guinn reminisced about the days when his father, another David Guinn, operated an antique store in the building together with Mr. Hitt. 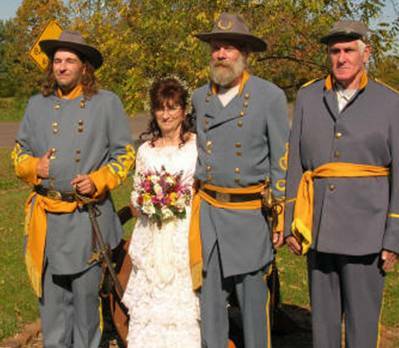 David Guinn, the groom, recalled his amazement when he revealed the name of JEB Stuart on the walls of the house. He used a glass shard to remove old layers of wall paper and paint. The youngest David Guinn remembered the day his father was lowered into a dry well, looking for Civil War artifacts. The disappointed boy was not aware that the real treasure was in plain view--the Civil War charcoal writings covering the walls of the house. Music for the wedding was provided by the Wilderness Run Dulcimer Players. They performed music popular during the Civil War. The musicians were Jan Moore, Sandy Wemmerus and two Directors of the BSF, Bob and Shirley Pfile. On Saturday, August 23rd, photographer Kenneth Garrett signed his new book, Journey Through Hallowed Ground: Birthplace of the American Ideal. The book includes photos from the Graffiti House and Cedar Mountain battlefield as well as others illustrating four centuries of American History along U.S.15 from central Virginia to Gettysburg, PA. 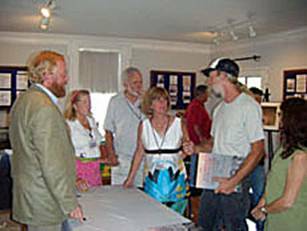 Copies of the book signed by the Mr. Garrett (pictured at left) are available in the Graffiti House gift shop. The Lake of the Woods Wilderness 'Tiques Antique Club, using funds from a grant from the International Questers Club, has donated a writing desk, chair and table to recreate a setting within the house depicting the use of the building as an administrative office during the Union army’s 1863-64 winter encampment. We still need a Federal officer’s uniform to complete the exhibit. Please contact Della Edrington at graffitihouse@brandystationfoundation.com if you can assist with this project. The first step of the Graffiti House Restoration project was taken in early October. Before any significant work could be done on the structure, four small areas of the plaster wall needed to be secured. According to Gregory Cowan, of Tidewater Preservation Inc., “Some of the sections were literally hanging by one horsehair”. To secure the plaster, small holes were drilled through the wall and a custom adhesive was injected behind the plaster to rebind it to the lath. In the future, all of the plaster will need to be bonded to the lath because the 150 year old keys that hold the plaster in place are crumbling. To accomplish this task without drilling more holes, the outside clapboard will be removed. But for now, the worst areas are secured, including one section that referred to the first shots of the war. “How Are You Fort Sumpter? Signed the 2nd N(ew) Y(ork) S(tate) M(ilitia). The next step in the project is to develop plans for a new foundation and reinforcing the floors and to raise the funds to carry out the work. If you would like to contribute to this project, please send a check to the Brandy Station Foundation and write Graffiti House Restoration in the memo line. Richard Deardoff, his Fauquier High School students and a handful of BSF volunteers worked on October 18th to clear the Kelly’s Ford trail and spruce up the Graffiti House for the winter season. Trees were planted in the Graffiti House yard and the picnic area was mulched. In addition to the work day activities, three young men moved over two tons of books (the new Reeder book) from temporary storage to their permanent location. Thanks to all who helped out that day! 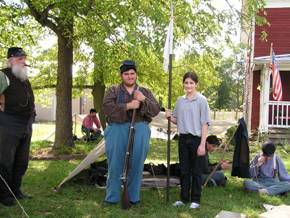 On October 25, the Brandy Station Foundation held its second annual “Spirited Evening at Brandy Station”. While the heavy rain during the day damped the bonfire, it did not dampen the spirit of the evening. VPI demonstrated some of their unique equipment, display images of some of their incidents and talked with the guests about the ghost hunting experience in general and some specific tales of VPI’s own members. They even received a few leads on potential future ghost hunts. VPI has hunted at the Graffiti House on two separate occasions. Both times they came away with inconclusive evidence. A special thanks goes out to William and Linda Lacy and Amy Beechler from Company D, 17th Virginia Infantry (The Fairfax Rifles), Ken Adam and Richard Girven for scaring our guests with tales of re-enactors who were not, stagecoach rides and the dead who were not quite dead yet – to the accompaniment of screams. With just over 50 people (plus our spectral residents) attending, the event was deemed a success. What made it more enjoyable is that many visitors stayed long after the demonstrations and stories were told and the refreshments were eaten, just enjoying the company, location and evening, and the Graffiti House. Fauquier County is sponsoring a Civil War Symposium on March 28, 2009 at the Fauquier High School. The first was the fight at Rappahannock Station in August 1862. It was here the General James Longstreet with his artillery held Union forces in their place as Stonewall Jackson’s men marched around their right flank. Some confederate positions for that fight are still visible today. The next action was the March 1863 fight at Kelly’s Ford, where the ‘Gallant’ Pelham fell. The Union Forces under Brigadier General William Averell passing through Morrisville and crossed the ford to initiate the fighting. The Gettysburg campaign and the Battle of Brandy Station have its roots in Fauquier County. The two Federal Cavalry wings under Brigadier Generals John Buford and David Gregg crossed into Culpeper County at Kelly’s and Beverly Ford on the misty early morning of June 9 to begin what was to become the largest cavalry battle during the Civil War and ever in North America. The final action was the second Battle of Rappahannock Station in November 1863. It was here where the Army of Northern Virginia was forced from Culpeper County for the last time. Author Gary Adelman, from Historic Associates Incorporated and a Gettysburg licensed battlefield guide has been compiling the majority of the information with input form various members of the historical community. Michael Block from the Brandy Station Foundation is serving on the committee that is overseeing the effort. More information and a complete list of speakers will be available in early 2009. The Brandy Station foundation traditionally receives a large percentage of our annual donations for Graffiti House restoration and local battlefield preservation during the last quarter of the year. There are several opportunities to fulfill your philanthropic goals by making your charitable gifts prior to December 31. CASH : The most common method of a charitable donation to the Brandy Station Foundation is cash, which is tax deductible if you itemize in the year of your contribution. Many individuals and trusts make annual year-end gifts, often in memory of a friend, a loved one, or as a gift for an anniversary or other special event. MATCHING GIFTS: Many employers will match charitable contributions made by their employees or retirees, enabling you to double or even triple the amount of your donation. Speak with your company’s personnel or human resources office about its matching gift program. PURCHASE GIFT MEMBERSHIPS: Today, instead of purchasing another gift card or clothes or gadget, give a Membership to the Brandy Station Foundation for a friend or family member. 2009 memberships run April through March at $25 per household. Check with your financial advisor to verify if all or part of this type of gift can be tax deductible. The Board of Directors of the Brandy Station Foundation is very appreciative of your unwavering support of our preservation and restoration missions. The Brandy Station Foundation Board of Directors has enacted a long overdue new membership policy. As with all non-profit organizations, the Foundation has been affected by the economy of the nation. Effective immediately, the ANNUAL dues for the BSF will be $25 per household. Our membership year will run April 1 through March 31. Any dues received between December 1, 2008 and March 31, 2009 will be applicable through March 31, 2010. Any amount you wish to send over the $25 annual dues will be gratefully received as a donation. If dues are not received by April 1, 2009 your name will be regretfully removed from our mailing list. We hope that you will understand the necessity of this move to annual dues, considering the cost of utilities, printing and mailing, etc. We feel that we are well within the range of dues charged by other similar organizations. We hope that you will remain a member of the BSF and continue your support of this vital organization because without contributions from people like you, our efforts toward the preservation of the integrity of the Brandy Station Battlefield area and specifically the Graffiti House will be in jeopardy.